Kick-It aims to offer high-quality bongs and does credit to the world-famous "Made in Germany" attribute. 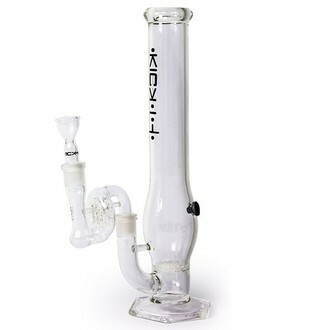 Their "Wild Wild West" glass bong is made from 5mm thick borosilicate glass and impresses with a two stage precooling system consisting of the Honeycomb 2.0 and Revolver precooler. Joint size: 18.8mm. Height: ca. 44cm.